We at Catalyst are reeling from the last couple weeks, like many of you. As the new regime moves quickly in its attacks on so many of our communities, at home and abroad, we are working with our allies to understand what is happening and develop strategies to respond as everything unfolds. This past weekend, half of our collective was in Philadelphia completing the Anne Braden Program and joining the Braden cohort in the streets. The rest of us took part in the two-day occupation of San Francisco Airport’s International terminal. 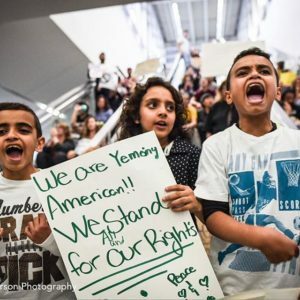 Led by the Arab Resource and Organizing Center, Alliance of South Asians Taking Action, and other grassroots organizations, ten thousand people successfully won the release of travelers detained under Trump’s “Muslim Ban.” People across the country took similar actions at dozens of airports from Portland, Maine to Birmingham, Alabama. This weekend demonstrated that people are ready to resist racist attacks in greater numbers than we’ve seen in generations. Visionary leadership from people of color-led organizations is paving paths as well as horizons for us to move towards, for example Mijente’s innovations in expanding the sanctuary city model. “On Saturday we illustrated self-determination: self defense, protection, resistance, rigor and reliance on one another rather than fear, retraction or reliance on law enforcement. Our communities fight for self determination. And this past weekend we actualized it. This past Sunday, ten thousand people joined alongside the leadership of AROC, ASATA, and other grassroots organizations to shut down San Francisco International Airport (SFO). We showed up to resist the Trump regime’s racist executive order repressing the ability to of our families and friends from Syria, Iran, Sudan, Libya, Somalia, Yemen and Iraq to travel freely. We took direct action to prohibit all business as usual at SFO, until all immigrant people being forcibly detained by US Customs and Border Protection on the airport were freed. And we won. All those detained under the Executive Order were released on Sunday. This was made possible by every individual who took action: every lawyer, every family member, every organization and every worker that joined in solidarity at SFO. Of the many ways to help grow the kind of movements that are going to get us to better days, one vital and tangible method is donating to build leadership of grassroots organizations like AROC and Mijente, who provide national as well as local leadership. Will you join me in becoming a monthly donor to AROC and/or Mijente, and ask 5 of your friends to get on board too? Will you identify which people of color-led liberation organizations in your town could use more material support, and see how your networks could contribute? We understand that what’s happening right now is the current iteration of centuries’ of white supremacy, and in some ways is not new. At the same time, we also hear from elders and peers that this political moment is unprecedented. It’s our job, all of us together, to bravely face our fears, confront the real threats, and move boldly towards vision.